So I went down for the first time on Sunday, September 25th with my friend Sam. 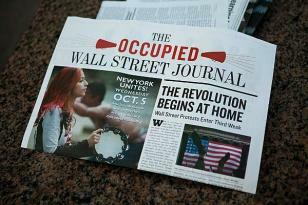 At first we couldn't even find Occupy Wall Street. We biked over the Brooklyn Bridge around noon on Sunday, dodging the tourists and then the cars on Chambers Street. We ended up at Ground Zero and I felt the deep sense of sadness that that place now gives me: sadness over how, what is now in essence just a construction site, changed the world so much for the worse. I also felt a deep sense of sadness for all the tourists taking pictures of a place where many people died ten years agowhich is now a testament to capitalism, imperialism, torture, and oppression. The landscape is strange. I notice that. We are in the shadow of half built buildings.They glitter and twist into the sky. But they also seem so naked: rust colored steel poking its way out of their tops and their sides, their guts spilling out for all to see. Actually, there was order and disorder, organization and confusion. I watched as a man carefully changed his clothing, folding each piece he took off and placing them carefully under a tarp. I used the bathroom at the McDonalds up Broadway and there were two booths of people from the protest carrying out meetings, eating food from Liberty Plaza, sipping water out of water bottles, their laptops out. They seemed obvious yet also just part of the normal financial district hustle and bustle. But even though at first I didn't know what to do while I was at Liberty Plaza, I stayed there for a few hours. I was generally impressed and energized by what I saw.People seemed to be taking care of each other. There seemed to be a general feeling of solidarity, good ways of communicating with each other, less disorganization than I expected and everyone was very, very friendly. The whole thing was quite bizarre: the confused tourists not knowing what was going on; the police officers lining the perimeter; the mixture of young white kids with dreadlocks, anarchist punks, mainstream looking college kids, but also the awesome black women who were organizing the food station; the older man who walked around with his peace sign stopping and talking to everyone; a young black man named Chris from New Jersey who told me he had been there all week and he was tired but that he had come not knowing anyone, had made friends and now didn't want to leave. And when I left, walking my bike back through the streets of the financial district,fighting the crowds of tourists and men in suits, I felt something pulling me back to that space. It was that it felt like a space of possibility, a space of radical imagination. And it was energizing to feel like such a space existed. After the General Assembly that night there was both a talent Show (“this is whata talent show looks like!”) on one side of the Plaza and an anti-patriarchy working group meeting (which became the safer-spaces working group) on the other. In some ways the juxtaposition of both these events happening at once feels emblematic of one of the splits going on in the square: talent shows across from anti-patriarchy meetings; an announcement for a zombie party right after an announcement about the killing of Troy Davis followed by an announcement that someone had lost their phone. Maybe this is how movements need to maintain themselves, by recognizing that political change is also fundamentally about everyday life and that everyday life needs to encompass all of this. There needs to be a space for a talent show across from anti-patriarchy meetings. There needs to be a food table, medics, and a library.Everyone needs to stop for a second and look around for someone's phone. And that within all this we will keep talking about Troy Davis and how everyone is affected by a broken, racist, oppressive system. Maybe, maybe this is the way? Here is the thing though: I've had these conversations before, I'm sure a lot of us in activist spaces have had these conversations before, the ones that we need to keep having about how to make sure everyone feels comfortable, how to not assume gender pronouns and gender roles. But there were plenty of people in this meeting who didn't know what we were doing when we went around and asked for people's names and preferred gender pronoun. A lot of people looked taken aback by this, who stumbled through it,but also looked interested when we explained what we were doing. They listened to the discussion and then joined the conversation about what to do to make sure that Occupy Wall Street felt like a space safe for everyone. People who said that they had similar experiences and were glad that we were talking about it. This is important because I think this is what Occupy Wall Street is right now: less of a movement and more of a space. It is a space in which people who feel a similar frustration with the world as it is and as it has been are coming together and thinking about ways to recreate it. For some people this is the first time they have thought about how the world needs to be recreated. But some of us have been thinking about this for a while now. Does this mean that those of us who have been thinking about it for a while now should discredit this movement? No. It just means that there is a lot of learning going on down there. On Thursday night I showed up at Occupy Wall Street with a bunch of other South Asians coming from a South Asians for Justice meeting. Sonny joked that he should have brought his dhol so we could enter like it was a baarat (Indian wedding procession). Here is the thing though: I've had these conversations before, I'm sure a lot of us in activist spaces have had these conversations before, the ones that we need to keep having about how to make sure everyone feels comfortable, how to not assume gender pronouns and gender roles. But there were plenty of people in this meeting who didn't know what we were doing when we went around and asked for people's names and preferred gender pronoun. A lot of people looked taken aback by this, who stumbled through it, but also looked interested when we explained what we were doing. They listened to the discussion and then joined the conversation about what to do to make sure that Occupy Wall Street felt like a space safe for everyone. When we got there they were passing around and reading a sheet of paper that had the Declaration of the Occupation of Wall Street on it. I had heard the“Declaration of the Occupation” read at the General Assembly the night before but I didn't realize that it was going to be finalized as THE declaration of the movement right then and there. When I heard it the night before with Sonny we had looked at each other and noted that the line about “being one race, the human race, formerly divided by race, class...” was a weird line, one that hit me in the stomach with its naivety and the way it made me feel alienated. But Sonny and I had shrugged it off as the ramblings of one of the many working groups at Occupy Wall Street. But now we were realizing that this was actually a really important document and that it was going to be sent into the world and read by thousands of people. And that if we let it go into the world written the way it was then it would mean that people like me would shrug this movement off, it would stop people like me and my friends and my community from joining this movement, one that I already felt a part of. So this was urgent. This movement was about to send a document into the world about who and what it was that included a line that erased all power relations and decades of history of oppression. A line that would de-legitimize the movement, this would alienate me and people like me, this would not be able to be something I could get behind. And I was already behind it this movement and somehow I didn't want to walk away from this. I couldn't walk away from this. And that night I was with people who also couldn't walk away. Our amazing, impromptu, radical South Asian contingent—which stood out in that crowd for sure—did not back down. We did not back down when we were told the first time that Hena spoke that our concerns could be emailed and didn't need to be dealt with then. We didn't back down when we were told that again a second time and we didn't back down when we were told that to “block” the declaration from going forward was a serious thing to do, that if our block to the Declaration was not agreed upon by everyone present we would have to walk away. I knew it was a serious action to take, we all knew it was a serious action to take, and that is why we did it. I have never actually blocked something before. And the only reason I was able to do so was because there were 5 of us standing there and because Hena had already put herself out there and started shouting “mic check” until they paid attention. And the only reason that I could in that moment was because I felt so urgently that this was something that needed to be said. There is something intense about speaking in front of hundreds of people, but there is something even more intense about speaking in front of hundreds of people with whom you feel aligned and you are saying something that they do not want to hear. And then it is even more intense when that crowd is repeating everything you say-- which is the way the General Assemblies or any announcements at Occupy Wall Street work. But hearing yourself in an echo chamber means that you make sure your words mean something because they are being said back to you as you say them. After the meeting ended we found the man who had written the document to remind him that he needed to take out the part about us all being “one race, the human race.” But it’s “scientifically true,” he told us. He thought that maybe we were advocating for there being different races? No we needed to tell him about privilege and racism and oppression and how these things still existed, both in the world and someplace like Occupy Wall Street. Let me tell you what it feels like to stand in front of a white man and explain privilege to him. It hurts. It makes you tired. Sometimes it makes you want to cry.Sometimes it is exhilarating. Every single time it is hard. Every single time I get angry that I have to do this, that this is my job, and that it shouldn't be my job. Every single time I am proud of myself that I've been able to say these things because I used to not be able to and because some days I just don't want to. This all has been said by many, many strong women of color before me but every time,every single time these levels of power are confronted it I think it needs to be written about, talked about, gone through over and over again. And this is the thing: that there in that circle, on that street-corner we did a crash course on racism, white privilege, structural racism, oppression. We did a course on history and the declaration of independence and colonialism and slavery. It was hard.It was real. It hurt. But people listened. We had to fight for it. I'm going to say that again: we had to fight for it. But it felt worth it. It felt worth it to sit down on a street corner in the Financial District at 11:30 pm on a Thursday night, after working all day long and argue for the changing of the first line of Occupy Wall Street's official Declaration of the Occupation of New York City. It felt worth it not only because we got the line changed but also because while standing in a circle of 20,mostly white men, and explaining racism to them, carefully and slowly spelling out that I as a woman of color experience the world way differently than the author of the Declaration, a white man; that this was not about him being personally racist but about relations of power; and that he urgently needed to listen to and believe me about this…this moment felt like a victory for the movement on its own. And this is the other thing. It was hard, and it was fucked up that we had to fight for it in the way we did but we did fight for it and we won. The line was changed, they listened, we sat down and re-wrote it and it has been published with our re-write. And when we walked away, I felt like something important had just happened, that we had just pushed a movement a little bit closer to the movement I would like to see-- one that takes into account historical and current inequalities, oppressions, racisms, relations of power, and one that doesn't just recreate liberal white privilege but confronts it head on. And if I have to fight to make that happen I will. As long as my people are there standing next to me while I do that.